Mars, our next-door neighbor in the solar system, hasn't given up many of its secrets yet. But when NASA's newest Mars rover, Curiosity, lands on the Red Planet next week, scientists hope to unlock a few more. The centerpiece of the Mars Science Laboratory mission, the Curiosity rover comes packed with a slew of instruments to study not only today's Martian surface, but also the surface of the past. The overarching strategy of NASA's Mars Exploration Program has long been to follow the water, and Curiosity is no exception. Following up on clues provided by previous missions, the newest rover will seek answers to questions about climate, geology, human exploration, and of course, whether or not the Red Planet could have once hosted life. Where might Martian life make its home? "Curiosity is not a life mission," Grotzinger told SPACE.com. "What we are doing in this mission is exploring for habitable environments." Because water is considered essential for the development of the only life known to exist — life on Earth — scientists are focusing on wet areas, past and present. A potentially habitable environment would also contain chemical and mineralogical signatures suggesting the presence of an energy source that microorganisms could have used at some point. It might also boast signs of organic carbon, thought to be one of the building blocks of life. The previous rovers, Spirit and Opportunity, were equipped to search for only water in the environments they explored. Grotzinger compared them to robotic geologists. "Curiosity is both a robotic geologist and a robotic geochemist," able to look for more than just water, he said. Of course, even if Curiosity finds ample environments where life could have flourished, that doesn't necessarily mean that it did. "It's entirely possible to find a habitable environment that was never inhabited, because life never originated," Grotzinger said. Either way, the rover can help pinpoint some of the best Martian environments to search for life on future missions, perhaps making them less hit-and-miss. What made a wet Mars dry? 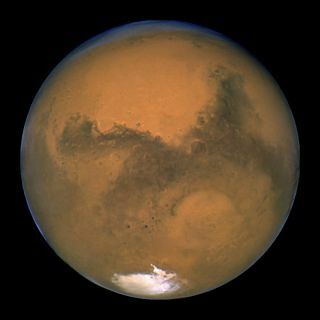 In its distant past, a warmer Mars likely sported a thicker, wetter atmosphere, with water running across its surface. Today, the planet is dry and dusty, with most of its water thought to be trapped beneath the surface. Curiosity will land at the base of Mount Sharp, which rises 3 miles (5 kilometers) from the center of the Gale Crater. Named for planetary geologist Robert Sharp, the mountain has layers that will be open to exploration by the rover. Grotzinger described these layers as pages in a book, with the first layers similar to the oldest chapters. As Curiosity ascends the mountain, it will explore the history of the planet embedded within the rocks. "By the time we get done, we'll get this great story on how the environment of Mars changed," he said. At the same time, the rover will explore shifts in the geology of the planet over millions of years, also folded into the rocks. Earlier rovers were able to find clues that water once existed on the surface of the planet, but Curiosity aims to dig deeper. "With Spirit and Opportunity, we were only able to determine that water was there," Grotzinger said. "We didn't get so much insight into how the water was produced or the environments in which the rocks were formed." But Curiosity won't just be sampling the climate of the past. While exploring the Martian surface, the rover will analyze the composition of the planet's climate today, measuring the temperature of the air, the ground, and the movement of the wind in its local area. When combined with the more regional measurements from space, the information should help provide a broader understanding of how the climate varies on the planet. How much radiation will humans experience? Some day, whether in the near or distant future, humans will travel to Mars. Before they arrive, they'll want to know how much radiation they'll have to deal with while on the ground. Readings taken by Curiosity should help solve that mystery. On Earth, much of the radiation emitted by the sun is blocked by the thick atmosphere. However, Mars has less of a shield protecting it. "No mission has ever measured the actual radiation on the surface before," Grotzinger pointed out. Knowing how much solar and cosmic radiation makes it to the ground will help future explorers know just how much protection they will need to don.